1.Saute atsuete in oil for 2 minutes. Set aside. 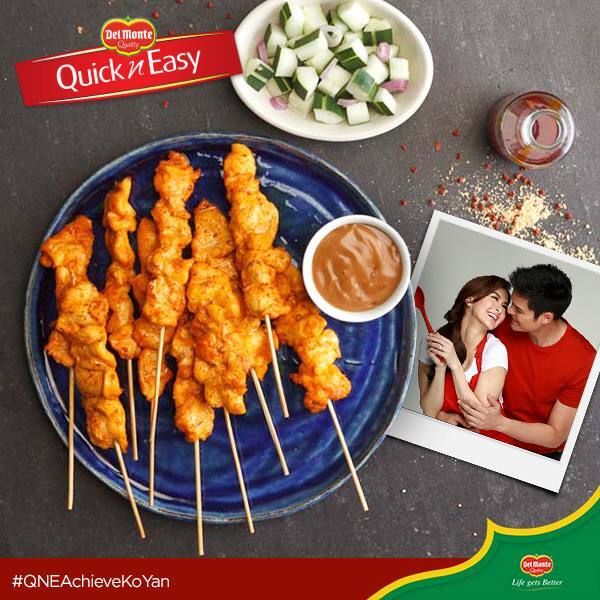 2.Combine chicken and DEL MONTE QUICK N EASY Kare-Kare Mix, peanut butter, brown sugar, salt ,pepper, and atsuete oil. Marinate at least 3 hours or overnight in the refrigerator. 3.Toss cucumbers and shallots together. 4.Thread chicken into skewers. Set aside marinade. Charcoal-grill or pan-grill until cooked on both sides. Serve with sauce and cucumber-onion mixture. Sauce: Dissolve left over marinade in water. Add remaining ingredients. Simmer until thick.